This week on Bitten By The Bug 2 my very talented teammate Jeri picked our cut. She asked us to use one of the boxes on Tags, Bags, Boxes and More to make a 3-D Gift Container. 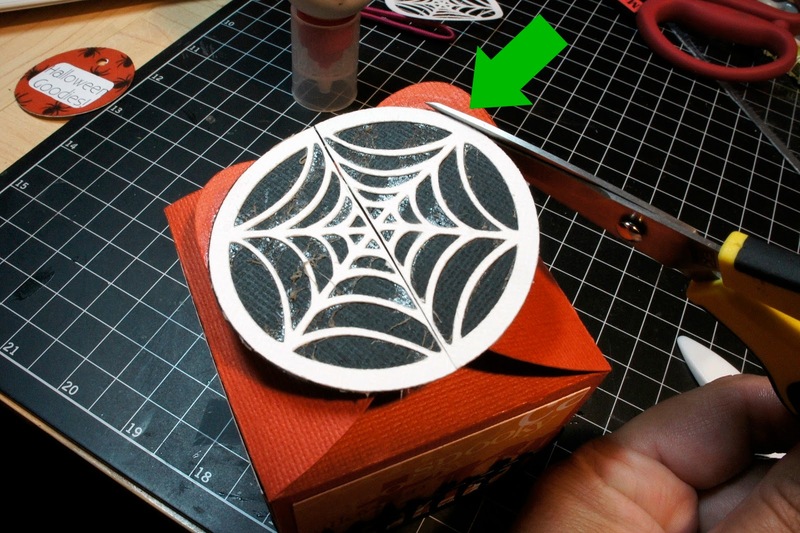 If you don't have Tags, Bags, Boxes and More you can use any 3-D Cricut Box. Even though I have a few new cartridges I am dying to try with 3-D boxes I decided to go "old" school and play along with the exact challenge. 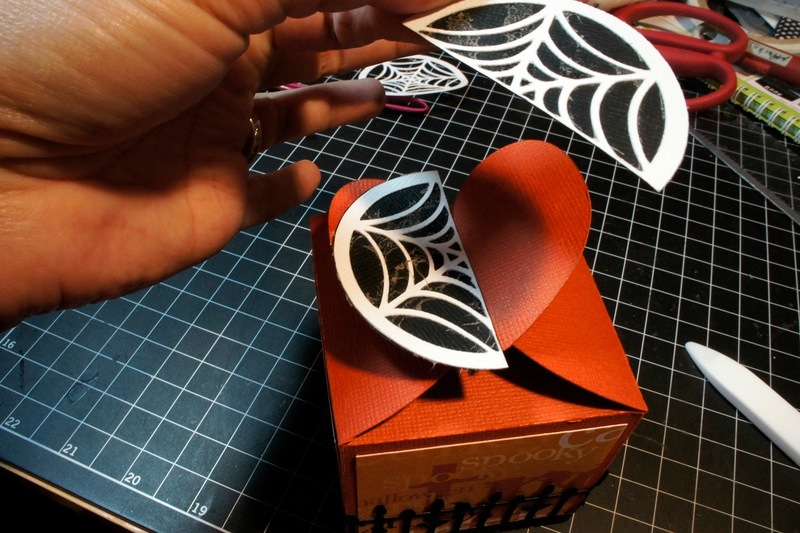 I used the box with the heart closure on the top from TBBM to make my gift container. Instead of using the heart, I decided to cover it up with a spider web more appropriate to the theme of my container. 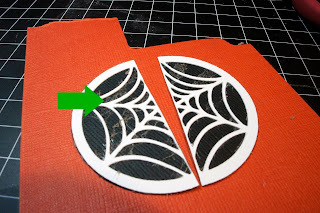 I cut a spider web from the Pumpkin Carvings Cricut Cartridge. To make a background for the web, I hid the contours and just used the circle to match exactly. Okay....stay with me here....I don't know what came over me (YES, I have been under alot of stress lately) when I put the adhesive on the back of the white part I wanted to make sure there was alot so it didn't come apart as it was the clousure for the box. I started rubbing the excess away and in my stressed out brain it was looking like real "webs" to me. So I left it....okay maybe not the best design choice, but really it does look like webs and once you rug it enough it isn't sticky anymore. Go ahead double click on the picture you will see what I mean, LOL! 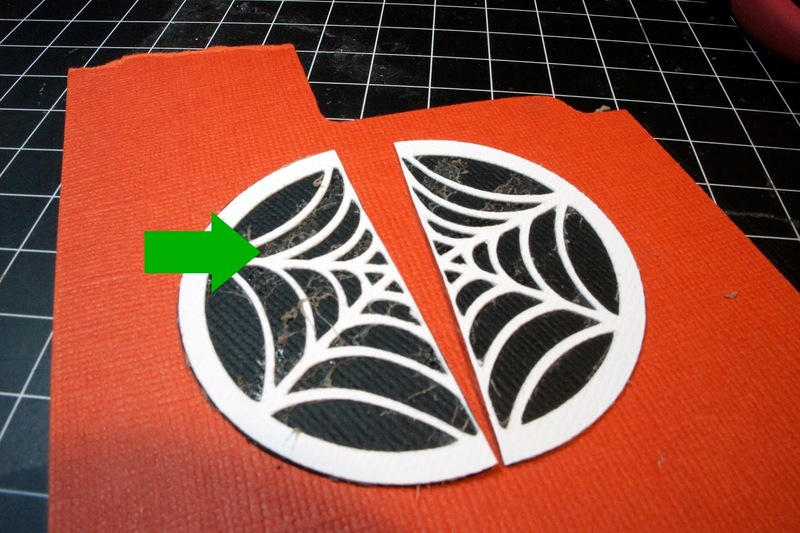 After I was happy (yes, I was) with the web I cut it in half to place over the heart to cover it. I then cut away the excess from the heart. The tag was also cut from TBBM with the window feature. The stamp is from My Pink Stamper's new Spookalicious Stamp set. Tags, Bags, Boxes and More = Box @ 8.84" on the Gypsy, Tag @ 2"
This is great! You did such a wonderful job! I really love it! maria, how nice you lil' box is. nice tip too! sometimes techniques like this do not hit my brain fast enough and i struggle with it, lol. Hi Maria That came out great. I love that orange. I do that all the time with the glue, but it actually looks pretty good on this it looks more like the spider web. I can't wait to do this project. Unfortunately I have to clean my art room first. Ps Maria did you notice that was How I did my box for the MPS blog hop on Friday night. I came back beacuse I didn't completely read your blog and it looked like the web thing worked for you. Great job. 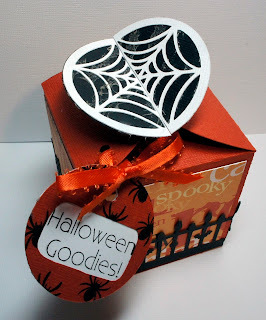 Spooktacular box! Love the glue webs, don't you love it when things work out like that? Great project! OOOHHHHH! I LOVE THIS! 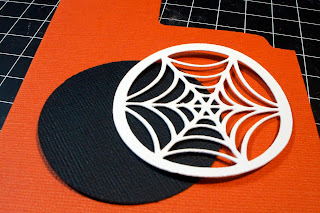 The spider web is just the perfect crafty accent! Maria, this is fantastic.... I love the colors you chose and your web is GREAT. Thanks for visiting me. I appreciated it. Maria Maria Maria...always doing a fab job. Your creativity is just my style. LOVE IT!!!! So super cute Maria! I love it!! Great Halloween box! The spider web closure was very clever! OMGosh! I love how you added the spider web on top. This is so cool!! I love this box, I always like to make fun little halloween gifts and you have given me some inspiration, thank you. I love your work! Isn't it fun when we make a boo boo and it turns out like we planed it, lol, love that spider web and what a great idea, you could customize it to any holiday or event! Thanks for the inspiration Maria, I love that little box and I'll have to try that in the future! I love that MS fence too, I couldn't find it last year maybe I'll get lucky this year, lol! She also had a Deep edge gothic fence and I Love and WANT that one too but again, can't find it, lol! Hi Maria! This is so fun and spooky! Love all the details on this! 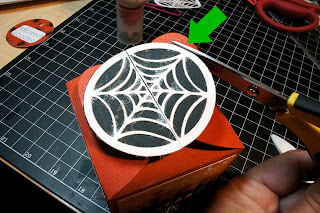 Great idea with the spider web! This is a great box Maria, that spiderweb on top looks terrific! So awesome!! I love the spider web and the fence around the base is perfect! TFS!!! Great box, Maria. Love all the details! 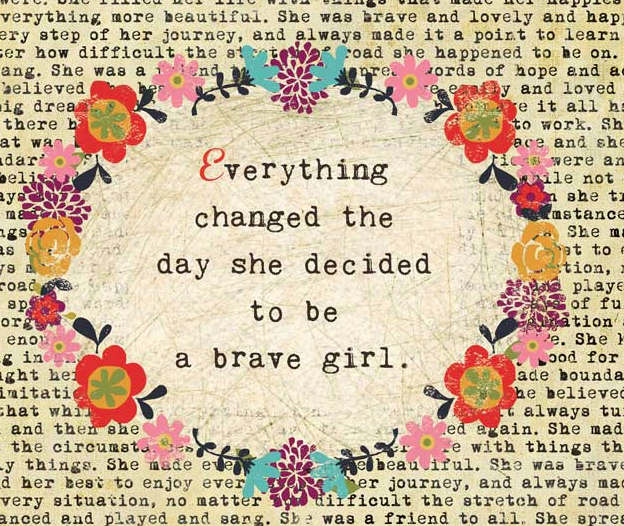 Maria, you never cease to inspire me! 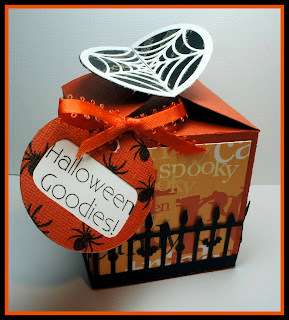 Not only is your box super cute, the spider web on top is soo creative!! Love it!! Great box and love how you did the web. That is so cool Maria! I would never have thought of using the Bags, Tags, box that way. Such a good idea! It took me a minute to find your comment box. But I really wanted to let you know how CREATIVE I think this is. Wonderful! Thanks for all the step-by-step photos, too. 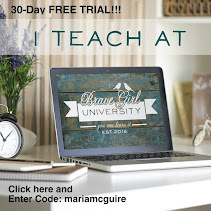 Love your project for the challenge. TFS!